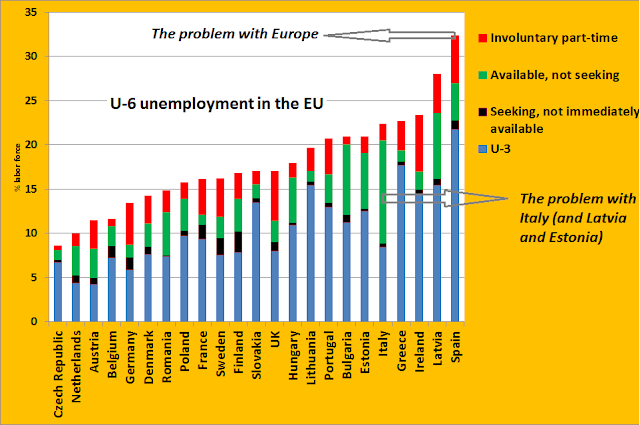 This graph shows a wider measue of unemployment for the countries in the European Union. The blue line (U-3) is the normal unemployment rate, as reported by the national statistical agencies. Unemployment is defined as the part of the labor force without a job that is available and actively seeking for a job. With this measure Spain clearly has the highest unemployment, followed by Greece and Lithuania. Next to the normal measure of unemployment people in the work force can also be seeking for work, but not immediately available or available but not seeking or involuntary part-time. When you add these factors you get the total (partly) workless labor supply. With this measure Spain is still the country with the highest unemployment. Latvia and Ireland are now second and third. Spain, Ireland and Sweden are countries with a relatively high percentage of the labor force being involuntary part-time. Italy and Latvia are countries that have especially a high percentage of the labor force available, but not seeking.